Hello all, hope your Tuesday was great. Today I have on one of the final sale blouses that I did not love. 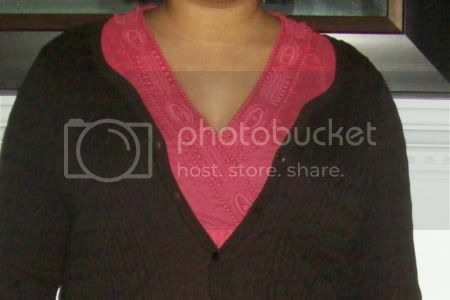 This one appeared to be very loose fitting in the catalog, but on me its a standard blouse fit - close to the body. I was going to just order a larger size, because I reallly like the top, but they ran out fast when it got marked down to $14.50 LOL. Ah well, so another blouse it is. :-) This is a 16P and I thought about sizing up to the 16WP. The half pint? Boo. The other thing that annoys me is when books and magazines label a body type as "petite" and pretend that it works for every woman under 5'5". Um, no. Height and shape are two different things. I'm short, but I'm not petite in the small boned sense. Argh! On the plus side, I love the color of that top! I'm not small boned either. I think of petite as those with tiny hands and feet. I have common feet in a size that always sells out first and short legs. Can we think of a word that identifies us other than vertically challenged? I keep a step stool handy but it hardly identifies my body type. Short and Curvy is good, but I have few curves. I ordered a jacket in that color. I believe I am going to love it. I'm kind of amused by the half-pint term. I'm not even five feet tall (short?) so I've been called almost every short name, but they always make me laugh. I guess it's just not something that bothers me at all. I kind of like being the short one. So I guess the only other term I can think of is short! Petite does seem to give the idea of being small-boned, which I don't think I am. Short is good. Short works. At any rate, I really like the pink color of the top! It looks really nice with your skin tone and I like it with the gray skirt and black cardi, rather than all gray or all black. You look so pretty! wow...what book were you reading? half pint?? I wish someone would call me half pint! Anyway...I love the detail in the tank, very pretty. of course I love the color.